As this year marks the 70th anniversary of the Universal Declaration of Human Rights (UDHR), a milestone document in the history of human rights drafted by representatives with different legal and cultural backgrounds from all regions of the world, the Filipino arts and culture community gathers on December 8 at the Cultural Center of the Philippines to pledge their support for human rights and dignity. According to Hudyat Convenor Edna Aquino, “this gathering of artists will mark another milestone in artists’ and cultural workers responding to the calls for social change”. The Philippines is one of the original signatories of the UDHR. To further promote the importance of human rights in the Philippines, Republic Act No. 9201 has also marked December 4 to 10 of each year as National Human Rights Consciousness Week. The artists’ gathering, dubbed as AHRT! 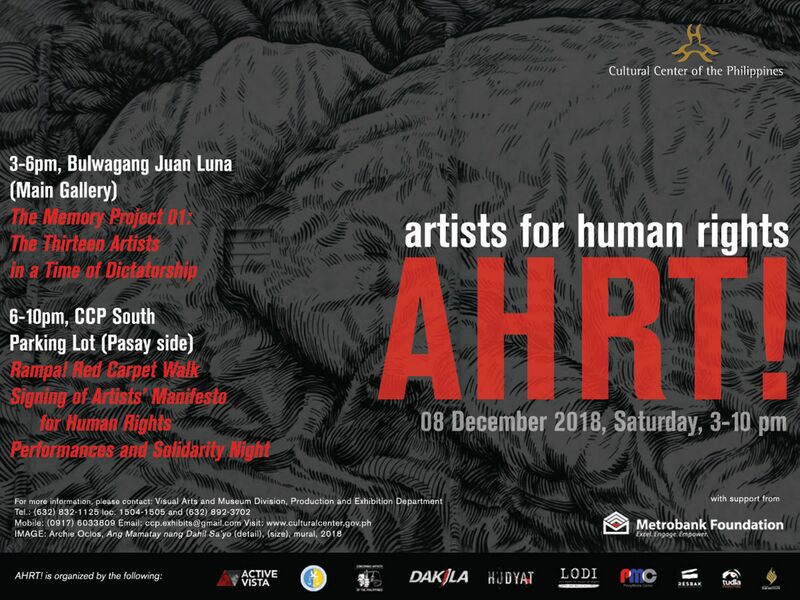 Artists for Human Rights, is an initiative of various artists and artists organizations, in cooperation with the Cultural Center of the Philippines (CCP), which aims to show the strong statement and commitment of artists to uphold, protect and promote human rights through the signing of an artists’ manifesto on human rights and dignity. The event will kick off with an artist talk, titled The Memory Project, at the Bulwagang Juan Luna from 3:00 to 5:00 pm. “Artist Talk: The Memory Project” is an intergenerational dialogue between artists who lived through and survived martial law, and those in the post-martial law period, on the nexus between artistic expression, and rights and dignity. The formal program for the Artists Gathering for Human Rights will be held from 6:00 pm – 10:00 pm at the CCP Power House, South Parking Lot (Pasay side), in front of the mural “Ang Mamatay nang Dahil Sa Iyo” by Archie Oclos, one of this year’s CCP 13 Artists Awardees. This evening of solidarity features a Red Carpet Walk and the signing of the Artists’ Manifesto for Human Rights and Dignity. The AHRT! Artists Gathering is one of a series of events that celebrates human rights amidst the current attacks on rights, freedoms and dignity in the country. It is part of the HumanRightsFest.PH, a 2-week long festival that opened last November 26 and will culminate on December 10, International Human Rights Day; participated in by more than 40 organizations, groups and institutions nationwide. The festival features film screenings, exhibit, workshops, talks and concerts. The first of the series of artist gatherings kicks off on December 3 at the UP Film Center. AHRT! is organized by Active Vista, the Commission on Human Rights of the Philippines, Concerned Artists of the Philippines (CAP), Cultural Center of the Philippines, DAKILA – Philippine Collective for Modern Heroism, HUDYAT: Filipino Artists for Human Dignity, Let’s Organize for Democracy and Integrity (LODI), Pinoy Media Center (PMC), Respond and Break the Silence Against the Killings (RESBAK), TUDLA Productions and the UP Film Institute.